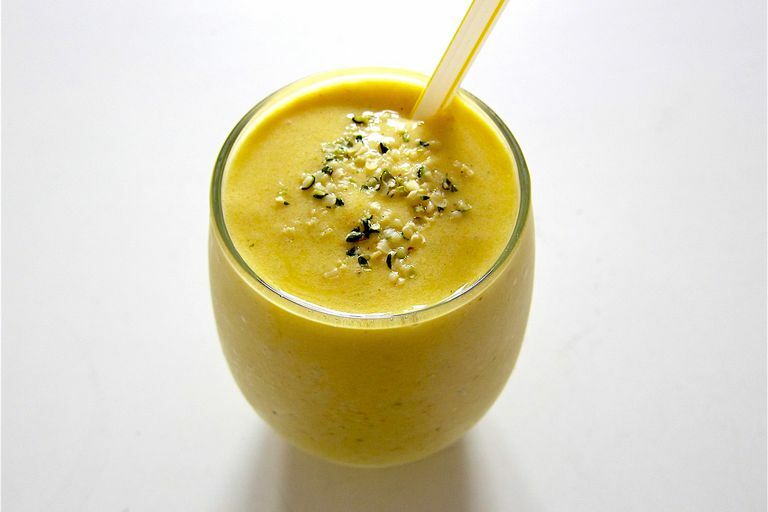 With Vitamins A and C coming from the mango and potassium supplied by the banana, this smoothie gives a bright flare to your morning. The oat bran is high in fiber and the hemp seeds provide polyunsaturated fats and protein. To top it off, turmeric contains a compound called curcumin, which has anti-inflammatory properties and may inhibit the growth of cancer cells. 1. Place all ingredients in a blender. Blend until smooth. Top with extra hemp seeds for garnish. Smoothies present the perfect opportunity to experiment. Add in your favorite milk or milk substitute, yogurt, or nut butter for increased calories and protein, and a meal that will keep you fuller for longer. Also, don't hesitate to spice it up! For that cozy fall or winter aroma, add in a teaspoon of cinnamon. Cinnamon may be protective against cancer, and contains antioxidants which have anti-inflammatory effects. To make this smoothie dairy free, substitute the low fat milk with almond milk. Almond milk has 0 grams of saturated fat, more calcium, an equal amount of Vitamin A, and about half the calories as low-fat milk. It is important to note that almond milk contains less protein than low fat milk too, though. Smoothies are ideal for when you are on the go. If you have a busy day, this is a simple recipe to make the night before, store in a mason jar in the fridge, and grab in the morning for breakfast. The milk, hemp seeds, and oat bran will keep you full and satisfied until lunch or that mid-morning snack. If you prefer to eat rather than drink your meals, you can turn any smoothie into a smoothie bowl. After blending, pour into a bowl and top with extra fruit, nuts, seeds and a tablespoon of nut butter for added protein and eat with a spoon.